“The six years it took Fauré to complete his PÉNÉLOPE have been multiplied no less than elevenfold for his 'poème lyrique' to reach the gramophone lists. Fauré has never been - and would never have wanted to be - a composer of vast popular appeal; PÉNÉLOPE, with its rather pedestrian libretto and lack of stage action (until its violent ending), has not attracted opera-house managements, and its absence of big arias and detachable set-pieces has caused mere voice-fanciers to ignore it. Yet it is a work of outstanding quality, revealing strength as well as lyricism. Not coldly classical but warmly human, it concentrates (like Monteverdi's opera on the same subject) on the story of Ulysses' return, in disguise, to the wife who has lovingly waited 20 years for him, the attempt to bend his great bow by the importunate suitors she has kept at bay by a subterfuge, and Ulysses' eventual proclamation of his identity and slaughter of the detested parasites. PÉNÉLOPE adopts a Wagnerian system of leading-motives (though the music, apart from the appearance of the TRISTAN chord, is far from being Wagnerian), and offers its singers… a great deal of expressive and gratefully written music. The love-theme, a variant of Fauré's favourite rising scale with a sharpened fourth (as in ‘Lydia’), is hauntingly beautiful." 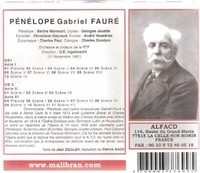 "PÉNÉLOPE is an opera in three acts by the French composer Gabriel Fauré. The libretto, by René Fauchois, is based on Homer's ODYSSEY. In 1907 the Wagnerian soprano Lucienne Bréval encountered Fauré in Monte Carlo. She expressed surprise that he had never written an opera, and introduced him to the young René Fauchois, who had recently written a play based on the section of the ODYSSEY dealing with Ulysses' return to Ithaca. Work on the score was slow because Fauré's teaching and administrative duties as head of the Paris Conservatoire left him only the summer holidays free for composing. For this reason he asked Fauchois to reduce the libretto from five to three acts and to cut the character of Ulysses' son Telemachus. Fauré worked on the opera each summer between 1907 and 1912. He orchestrated most of the piece himself, in contrast with his frequent practice of delegating orchestration to one of his students. However, at the end of October 1912 he had orchestrated only half the score; with the premiere announced for the following March he recognised that with his commitments to the Conservatoire entrance examinations he needed the help of an assistant to ensure that the score would be completed in time. Of composers of his generation, Fauré was one of the least influenced by Wagner, but for PÉNÉLOPE he adopted two essential elements of Wagner's compositional technique: character and themes are represented by leitmotifs, and the music is mostly continuous, with no individual arias. These are the only ways in which the work is Wagnerian, though the two main roles call for voices of heroic quality. The premiere at Monte Carlo was not a great success, partly because the director of the theatre, Raoul Gunsbourg, was more concerned with promoting his own opera, VÉNISE, which made its debut four days later. Fauré was not greatly troubled at the modest success of the piece: he regarded the Monte Carlo production as 'a rehearsal for Paris', where the work was to be given two months later. PÉNÉLOPE was rapturously received at the Théatre des Champs-Elysées in Paris on 10 May, 1913. Several newspapers from foreign countries thought it worthwhile sending their critics to the premiere. The Paris cast was headed by Bréval, with Lucien Muratore as Ulysse, Cécilie Thévenet as Euryclée and Paul Blancard as Eumée. Muratore in particular was considered a great improvement on his Monte Carlo counterpart. The piece was only very briefly the principal topic of discussion in Parisian musical circles: less than three weeks after the premiere of the opera the Théatre des Champs-Elysées was the venue for the first performance of THE RITE OF SPRING. The scandal at and after the ballet's premiere preoccupied the French press, and Fauré's opera was hardly mentioned. A second blow to the fame of PÉNÉLOPE was the financial collapse and near bankruptcy of the theatre six months after the premiere. The sets and costumes had to be sold. The Opéra-Comique took PÉNÉLOPE into its repertoire on 20 January, 1919, with a cast including Germaine Lubin in the title role and Charles Rousselière as Ulysse and Félix Vieuille as Eumée, conducted by François Ruhlmann. Later revivals were conducted by Albert Wolff (1922), Inghelbrecht (1924, with Claire Croiza in the title role), and Wolff again in 1927 and 1931, totalling 63 performances. On 14 March, 1943 the Paris Opera staged PÉNÉLOPE, conducted by Ruhlmann, with Lubin in the title role."